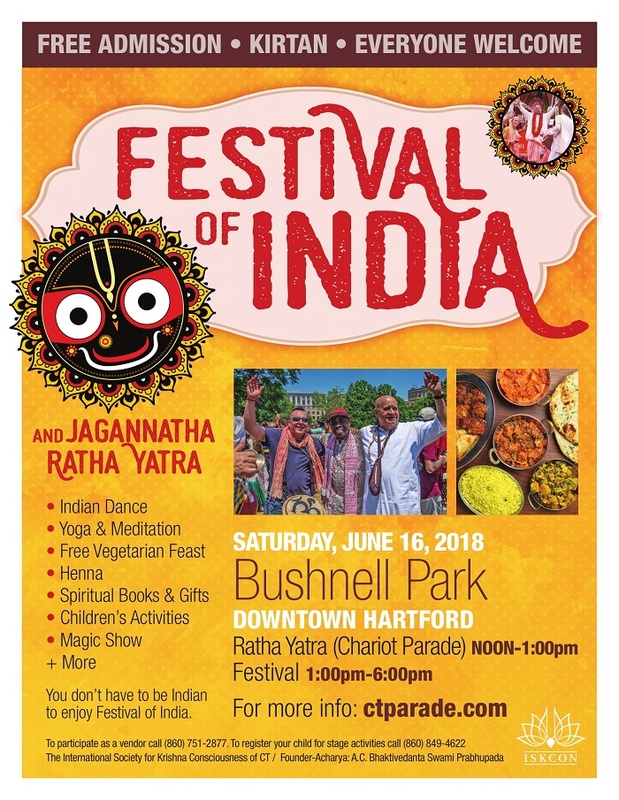 Festival of India Coming Back to Bushnell Park--Hartford, Ct.
Read more about Festival of India Coming Back to Bushnell Park--Hartford, Ct.
Having seated Lord Narasimhadeva upon the lotus of one's heart, one should recite the following mantra: May Lord Narasimha, who protects all the planetary systems, protect my head. 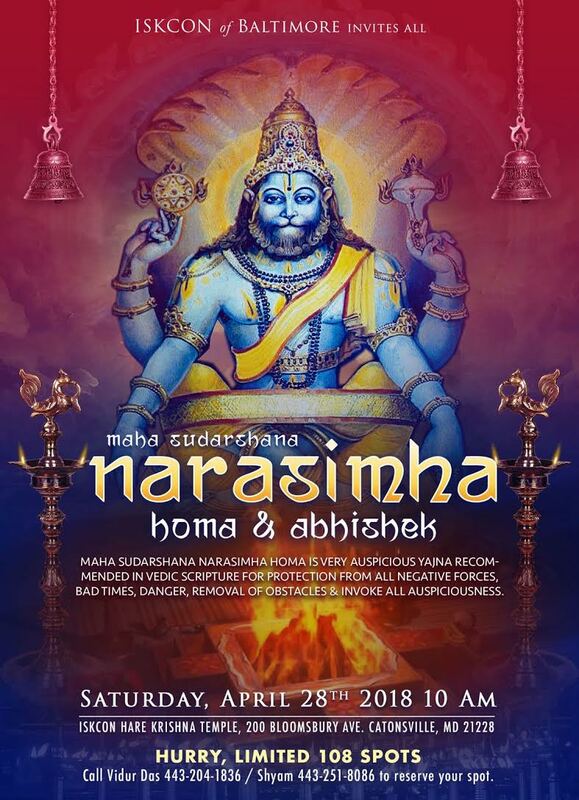 Lord Narasimha roars loudly and causes others to roar. With His multitudes of arms. He tears the demons asunder and kills them in this way. He is always seeking out and tormenting the demoniac descendants of Diti, both on this earth planet and in the higher planets, and He throws them down and scatters them. He cries with great anger as He destroys the demons in all directions, yet with His unlimited hands He sustains, protects, and nourishes the cosmic manifestation. 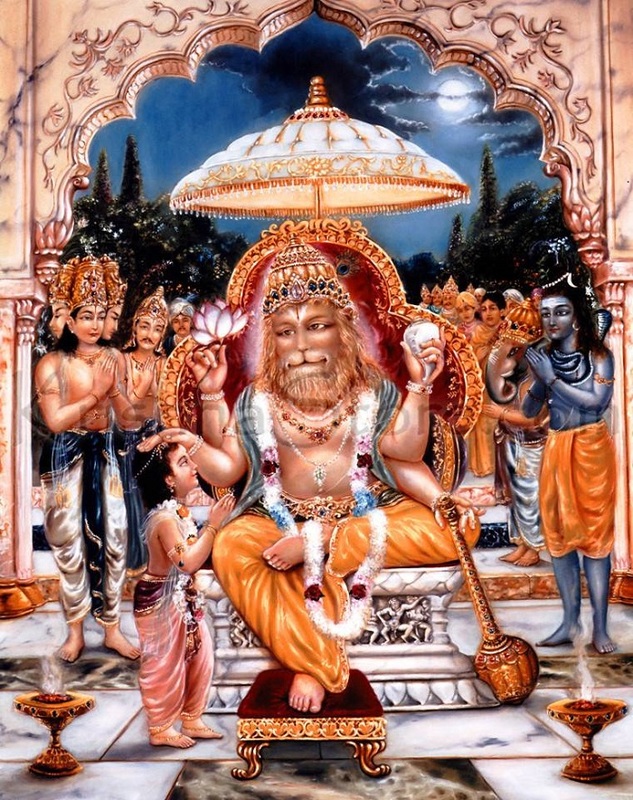 I offer my respectful obeisances to the Lord, who has assumed the form of a transcendental lion. 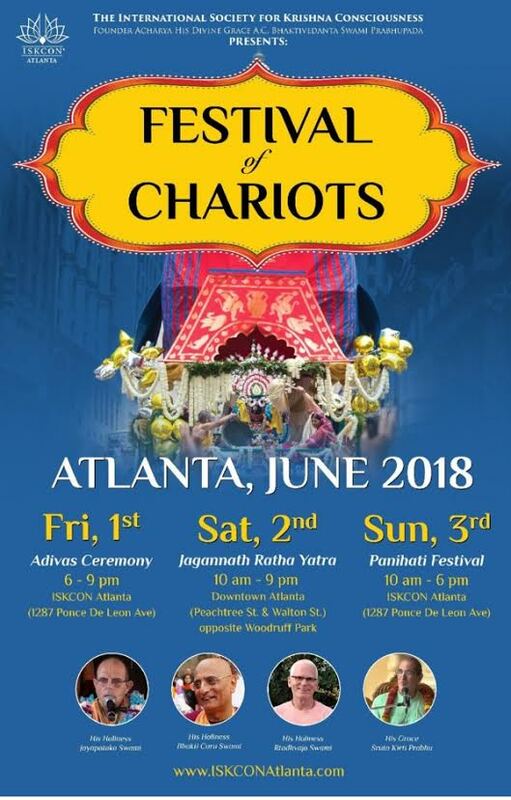 The Festival of the Chariots, referred to as Ratha-Yatra, originated 5,000 years ago in India on the East Coast state of Orissa in a city called Jagannatha Puri. The Festival celebrates Lord Krishna’s return to Vrindavan and is held annually in the months of June -July to honor Lord Jagannatha, which means Lord of the Universe. Lord Jagannatha is a particular Deity form of Lord Krishna, and the residents of Puri have been worshipping this form for many centuries. Five hundred years ago, Lord Chaitanya, the most merciful incarnation of Lord Krishna, used to visit Lord Jagannatha in the temple daily and see Him in a mood of intense separation, much like Srimati Radharani who was parted from her beloved Krishna most of her days. The Festival of Chariots is an invitation for the Lord Jagannatha, to enter into our hearts by pulling His cart down a street. It is an ancient Indian tradition, brought to the West by A.C. Bhaktivedanta Srila Prabhupada (1896-1977), the founder-Acharya of the International Society for Krishna Consciousness. 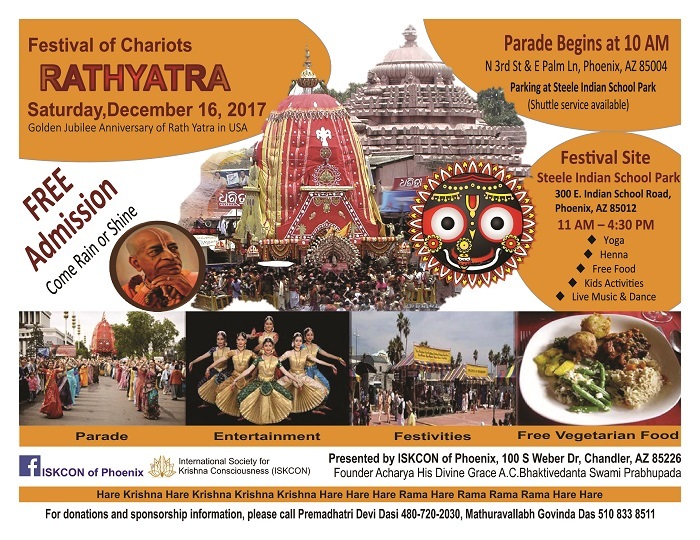 On December 16th, ISKCON of Phoenix temple held their first Ratha Yatra celebrations. Lord Jagannatha, Lord Balarama, and Lady Subhadra were placed in canopied chariots which were decorated with flowers, flags, etc. The deities looked very opulent with the tahiyas (head pieces) that Badrinath Prabhu, from Dallas, personally crafted. The procession started with chanting Lord Jagannatha ashtakam by ISKCON devotees. 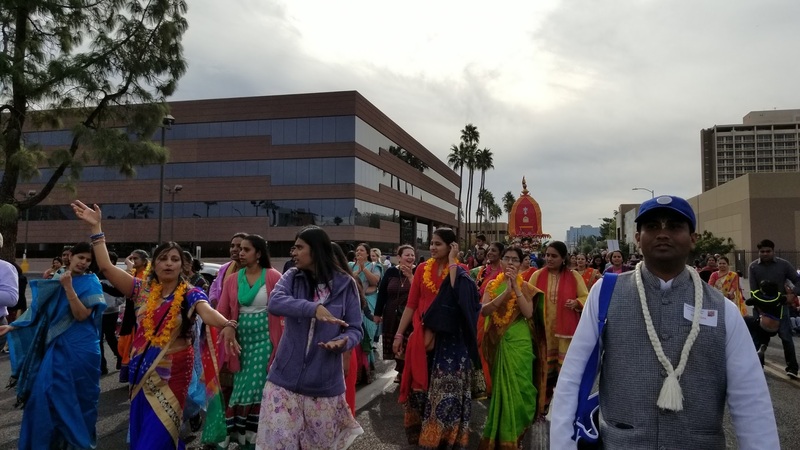 Arizona Interfaith Chairman, Larry Fultz performed the coconut breaking ceremony Bharatanatyam dancers from Sampradaya School of dance offered Pushpanjali prayers dance to the Lord. The cart parade, with mridanga drums and kartala cymbals resounding, proceeded from Palm Lane to Steele Indian School Park. During this procession, many people experienced Lord Jagannth’s darshan and received His merciful glance. 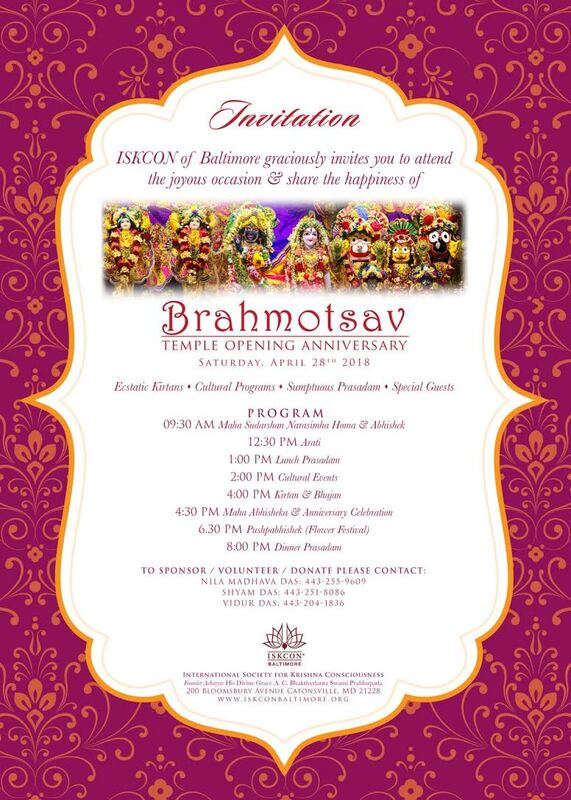 Devotees handed out Prasadam sweets, as well as books and flyers while dancing to the melodious Hare Krishna Kirtan. Many that day perhaps had no idea the spectacle they would experience as the procession passed their apartments and streets! While the cart paraded down, back at the Steele Indian School Park-the main event venue—the Hare Krishna Festival of India’s various transcendental exhibit booths greeted visitors: Mantra-Yoga/Chanting of Maha Mantra—Hare Krishna Hare Krishna Krishna Krishna Hare Hare Hare Rama Hare Rama Rama Rama Hare Hare, Vegetarianism-The Higher Taste, Changing Bodies/The Science of Reincarnation, Bhagavad-Gita, Experience Yoga—Hatha Yoga, Books on Yoga & Meditation, Henna & Face Painting, and a special exhibit explaining the life of ISKCON’s Founder Acarya—A.C. Bhaktivedanta Swami Srila Prabhupada. 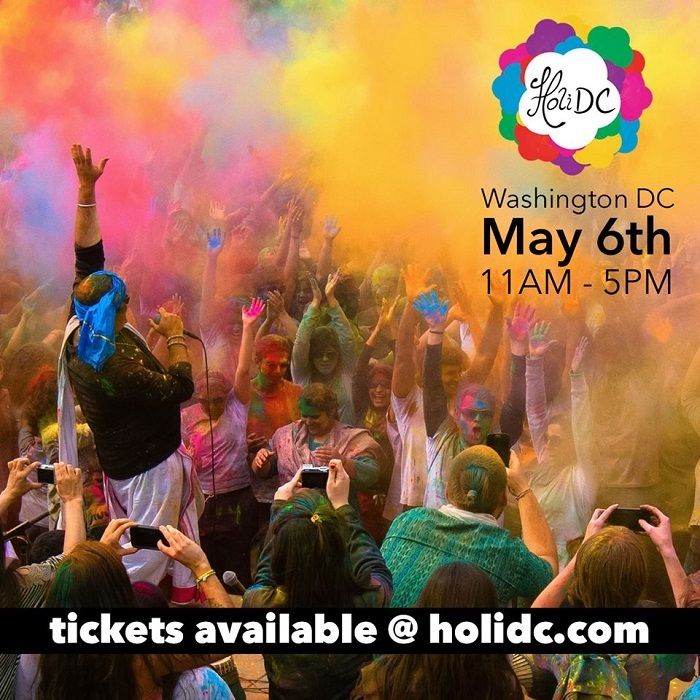 Several other vendors joined in our booth display, including crafts, food, traditional clothes and jewelry. Upon the cart’s return to the pavilion, various cultural events were performed at the stage included ISKCON of Phoenix Sunday School performance, Bharatanatyam by Sampradaya School of dance and other individual performers, Mohiniattam, Chenda (tradional drum performance) by Kerala Hindu Association and Kirtans by different groups. During the stage performance, various bits of philosophy were explained to the guests, such as the origin and amazing truths about Jagannatha Puri events by the emcees (Radhika DD, Anita Mataji, and Mahi Mataji). Temple President Prema dhatri Mataji invited the guest of honor, Arizona Corporate Commissioner, Tom Forese on to the stage for a short address to the attendees. 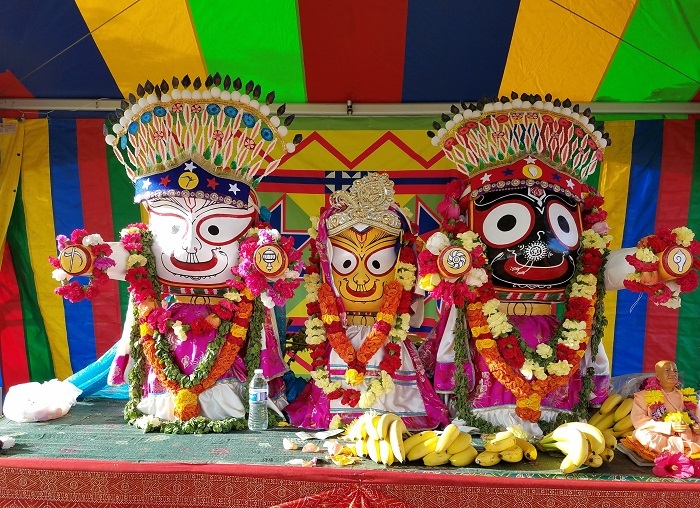 The deities, Lord Jagannatha, Baladeva, and Subhadra, were moved to a nicely decorated tent where They were offered prayers and bhoga .Vegetarian prasadam, or sanctified food, was served throughout the event to at least 1,500 festival attendees. 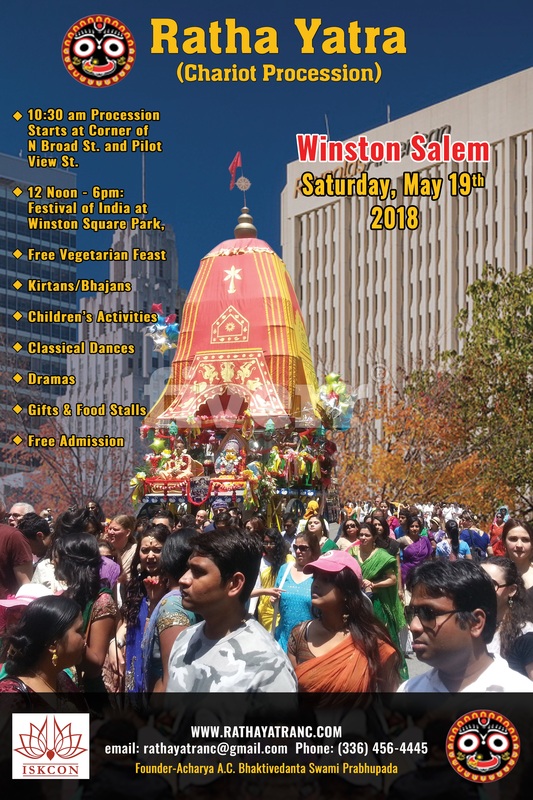 The event concluded with Prema dhatri Mataji thanking the attendees, volunteers, devotees, and City officials for their support for this great event. Phoenix ISKON will make this an annual tradition henceforth. A huge thank you to Mathura Vallabha Govinda Prabhu for taking the lead to organize this festival. 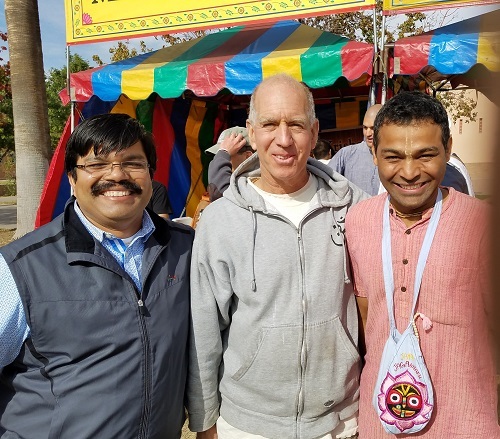 We are so very grateful to Madhuha Prabhu and Ratnabhushan Prabhu for their help in bringing the deities, the Festival of India and the chariot to Phoenix for the festival. 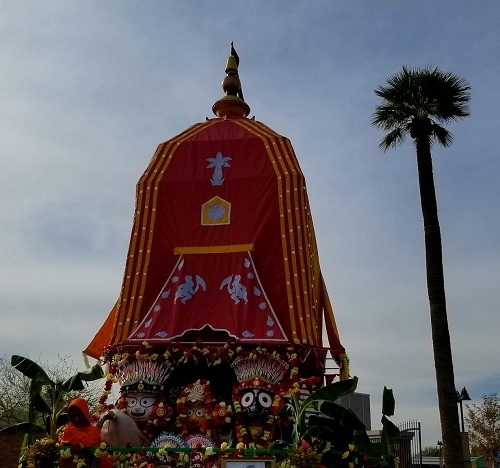 With this event, ISKCON of Phoenix was able to join Srila Prabhupada’s legacy of celebrating Jagannatha Ratha Yatra. This was a great opportunity to take the Lord’s mercy out to the streets in the form of the deities and the holy names. 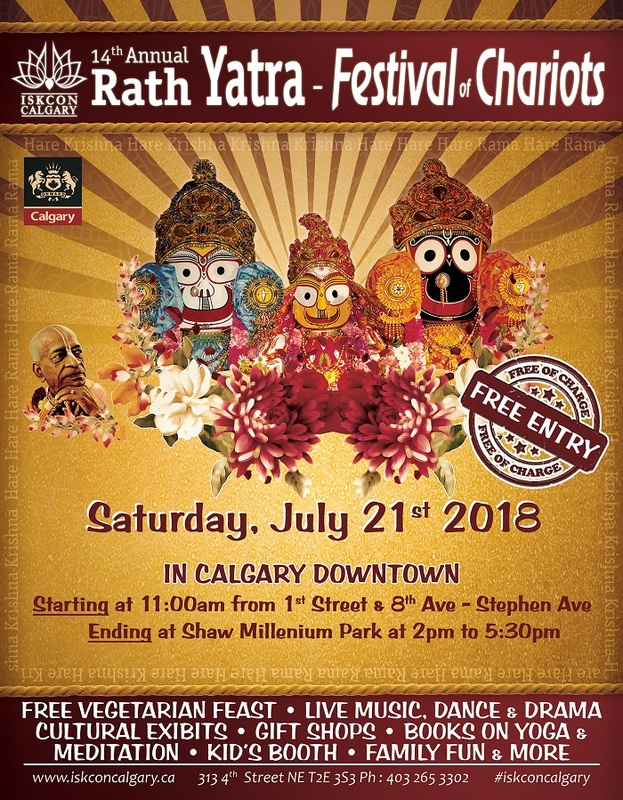 Jai Jagannatha, Hare Krishna! 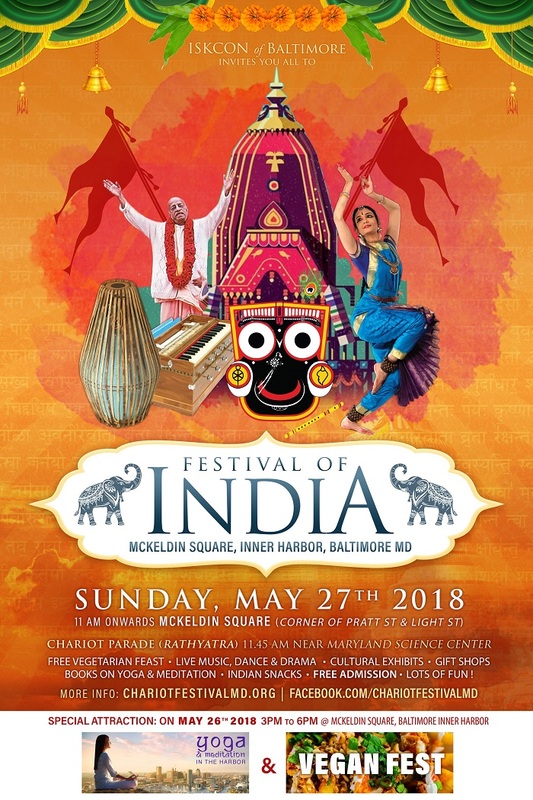 Hare Krishna Festival of India Coming to Phoenix, Arizona! 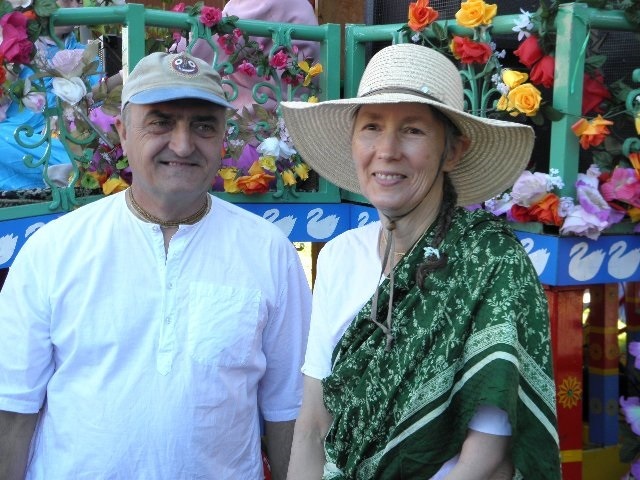 Read more about Hare Krishna Festival of India Coming to Phoenix, Arizona!